Built on a small peninsula on the edge of Sydney Harbour, the curvilinear exterior of this home evokes an ocean liner and the rooms within are reminiscent of finely appointed cabins hovering over the water. 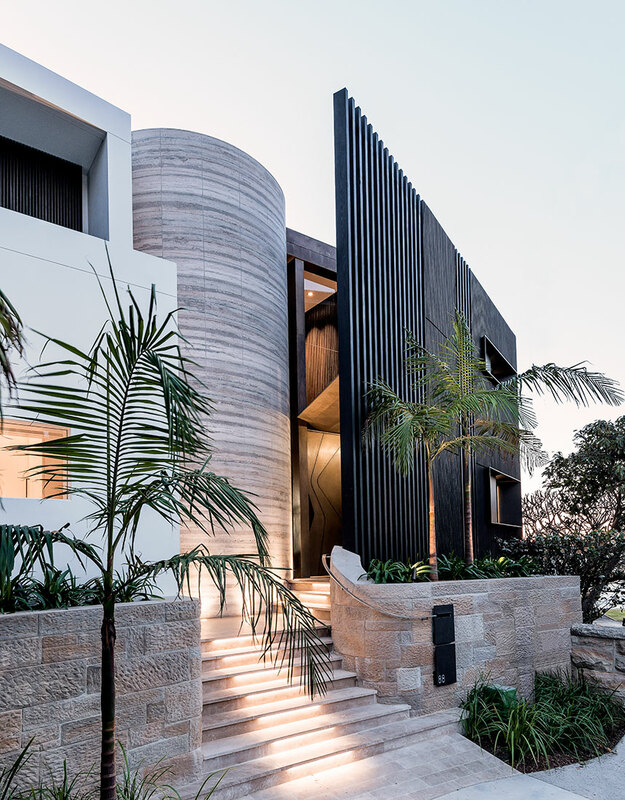 The clients’ brief was to create a family home that is contemporary and unique, capitalising on the extensive access to harbour views afforded in every living space across the 35m harbour frontage. Our interpretation of the interior was founded on the geometry of the architectural envelope – designed by Architects Bruce Stafford & Associates – with its curves and linear banding. It presented an opportunity to deliver a design language of oval and circular forms employed throughout and prompted clever solutions in both custom and selected furniture, e.g. the first item specified was the 3.5 metre long elliptical dining table, taking its cue from the spiral stair and oval coffer. Strong architectural elements are woven into the interior whilst a warm dark palette calms the spaces mitigating the brilliant light from the water. Vertical screen elements were ‘wrapped’ from outside in, creating depth and contrast to the light and open water façade. The sculptural staircase sits at a converging point in the space and the ribbon balustrade threads through three levels washing the interior with natural light through the skylight on the southern side of the house. On the lowest level of the property – a boathouse has been created that nestles almost unnoticed into a Sydney sandstone facade creating a beautiful space close to the lapping water. Waterfront is allocated to every main living space – all with access to balconies – creating strong focal points to be considered in the placement of furniture. The palette has strong contrasts of colour and texture to offset the effect of the external light and create warm and inviting spaces, taking the art collection into account. The reflection off the water floods the rooms with light, which we took into account in our selection of materials which included stone, dark stained timber and light, white walls, shades of warm grey and charcoal stucco, steel, glass, bronze, black chrome and stitched leather. Interior design (by Eloise Fotheringham) and decoration (by Melanie Kightley) were interwoven into the architecture, resulting in a cohesive and refined design. The liaison between Hare + Klein, the Architects BSA, the Client and the Builder (Innovative Building Services) resulted in a home which shares the vision of its contributors.